Foam Blowing Agents Market size was valued at over USD 600 million for 2015 and will grow at over 7% CAGR. 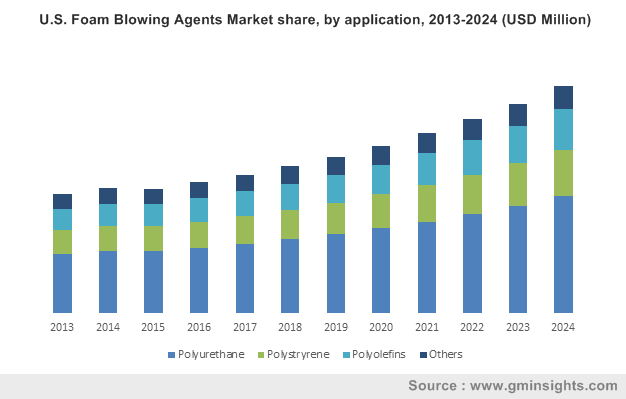 Flourishing polystyrene, polyurethane, and other product-based foam businesses are driving the foam blowing agents market. Foam blowing agents find applications in polymeric foam manufacturing to enhance the desired foam properties. The demand for polymeric foam is increasing due to its usage in the construction and appliances industry. The construction sector has witnessed a moderate growth in the past five years and is likely to grow significantly in the next few years. The global population growth and a rise in average disposable incomes have further boosted the construction industry in Vietnam, China, India, Malaysia, and Indonesia. Polymeric foams are extensively used in building and construction sectors. Increasing foam usage in the construction industry is likely to bolster the foam blowing agents market during the forecast period. Improved living standards and rise in purchase power parity have developed flooring and furnishing industry in recent years. The booming hospitality sector is demanding an exceptional quality of flooring material and aesthetically sound furnishing. Polymeric foams are used in flooring and furnishing for shock absorption and to give a high-quality aesthetic appearance. The foam blowing agents market will witness a promising growth in the flooring and furnishing industry owing to the increasing adoption of polymeric foams. Polymeric foams have applications in the medical devices and packaging industry and other emerging applications. Technological advancements and rapid medical industry growth have boosted the demand for medical devices. An increase in the global trade has stimulated the need for safe and reliable packing of products for their transit. Packaging is mostly done using foam-based polymers owing to their shock absorbing nature. Thus, the growth in medical devices and packaging industry is contributing to the market growth. The hydrocarbons segment accounts for more than one half of the foam blowing agents industry volume and is likely to maintain its share over the forecast period. The hydrocarbons segment was valued at over USD 200 million in 2015 and will expand at over 7% CAGR. Hydrocarbons are widely used in polyurethane foam in varied end-user industries such as automotive, appliances, construction, flooring, furnishing, etc. Others segment including azodicarbonamide, inert gases, methyl formate, methylal, and water is likely to expand at more than 9% CAGR and contributes to over 15% in the foam blowing agents market. Although a smaller segment in terms of market share, the collective growth of the segment is significant. Foam blowing agents have major applications in polyurethane foams. Polyurethane foams are used in industries such as automotive, construction, flooring, furnishing, medical devices, and packaging. Rapid industrialization coupled with infrastructural development has boosted the construction industry globally. Moreover, improved living standards and disposable incomes have boosted the hospitality industry, such as hotels, malls, and spas, driving the construction industry. Germany established the automobile business and increased the high-end luxury car demand in India, Japan, and Korea. There is a rise in the adoption of medical devices owing to the developing healthcare industry in Europe. Rising demand for enhanced healthcare and medical devices in the U.S will drive the foam blowing agents market in the region. Asia Pacific accounts for nearly half of the foam blowing agents market consumption globally. Booming infrastructural development has led to an increase in the construction industry in this region, majorly led by India, South Korea, Thailand, and Vietnam. Rapid industrialization and technological advancements in this region have contributed significantly to the foam blowing agents end user industries such as automotive, packaging, and medical devices. North America will depict a positive outlook in foam blowing agents market owing to its global presence in the pharmaceutical sector and food packaging industry. Europe is at a relatively nascent stage in this industry and accounts for approximately 15% of the revenue generation. Europe’s growth is attributed to its ever-increasing automobile industry, frozen food packaging, etc. Polyurethane foam is used in automobile interiors such as seats, steering wheels, door panels, etc. Growing automobile industry will thus boost the market majorly in Asia Pacific and Europe. The global foam blowing agents market is consolidated in nature and is concentrated between a few key manufacturers globally. The major players in the market are Sinochem Group, AkzoNobel N.V., ZEON Corporation, Haltermann GmbH, Daikin Industries Ltd., Honeywell, Arkema S.A., Solvay S.A., DuPont, and Exxon Mobil Corporation. A major chunk of the market share is consolidated between these key players. Foam blowing agents have become essential ingredients used in foam substrates, providing cellular structure to materials. Foaming of polymer provides advantages such as thermal and acoustic insulation, reduction in the final product weight, and less material usage. Further, foam blowing agents have an opportunity to be used in various environmentally friendly products such as methyl formate, HFOs, and methylal. Moreover, there has been a revolution in foam blowing agents market through the introduction of low Global Warming Potential (GWP), zero Ozone Potential Depletion (OPD), non-toxic and non-flammable foam blowing agents.